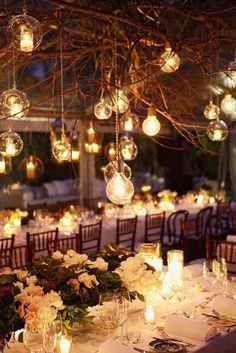 Even the smallest outdoor space can be transformed by hanging lights and candle votives. Lantern strings and ivy are an easy and whimsical combination. Mason jars keep flames safely contained as candle holders, lanterns and shades. Use them as centerpieces or hang them as pendant lights. There is a great DIY for hanging mason jars here. You can make them more decorative by using different stones or sand on the bottom, or by tying some sort of ribbon around the tops. Tin cans with punched holes also work well. Empty glass bottles are another lighting option. You can find short light strings here and longer options here. Lights can either be inserted through the top of the bottle or drilled in through the side. Another cool idea to make a garden that actually glows is to stage flower lighting as if it were the real thing. Grapevine orbs are another easy DIY. You can find them anywhere in the flower district or at your local arts and crafts store.